Over the past few months I’ve written extensively about my concerns for the future of our profession. This is an emotional issue and, as you might expect, has generated a good deal of comment. In fact, no topic has ever generated more email with the exception of the very divisive topic of board certification—or what we call board certification. From colleagues across the country, the general consensus—with virtually no dissent—has been that we have too many schools, too many graduates and a profession that, if it doesn’t right itself will soon, be in serious trouble. Rarely have I seen so many on the same page on a single issue. Unsurprisingly, some in academia don’t see these concerns in the same way and have taken my comments as personal attacks on their institutions or have convinced themselves that I have declared a holy war on optometric education. Nothing could be further from the truth. Here is the truth as I see it. Every academic institution has an inviolable duty to serve the public good by producing qualified, knowledgeable and skilled graduates. This starts with the admission process where entering students must be selected that can be molded into capable clinicians and successful practitioners. Our institutions have an obligation to the profession at large to responsibly plan for the needs of the public and ensure that its graduates can achieve professional success and financial independence. Ideally, this process should be self-regulating, as it has historically been in other professions. Organizations such as ASCO, the AOA and the ACOE should approach with balance and transparency and discourage new and existing programs that fail to meet the needs of the public and the profession. The most recent ASCO/AOA optometric manpower study and its subsequent spin was neither balanced nor transparent. Let me make it clear that I don’t think the problem is our new schools. The problem is too many schools. I recently visited Midwestern University Arizona College of Optometry, and I was honestly blown away by how the program has evolved and grown since its inception. Likewise, I have visited older programs that are excellent. Truth be told, some newer and some older programs have not kept up, and their continued existence should be in question. Common sense planning suggests that we clearly don’t need more than one program serving a single city or state unless there are truly extenuating circumstances. Our organizations must take strong charge of controlling our profession’s future. That control starts with the number and quality of our educational programs. However, we all must have a voice in this. I am asking you to complete this simple open questionnaire about your perceptions regarding optometric education, the number of programs we have and need and of the quality of current optometric education. Let your voice be heard. Do you believe that our educational institutions are meeting the needs of the pubic and the profession? For current needs are there (too many / just enough / too few) optometric programs. For future needs are there (too many / just enough / too few) optometric programs. Are you concerned about optometry school admission standards and decreased candidate pools? Are you concerned about the quality of current optometric grads? Vascular factors have been reported to influence the development and progression of glaucoma. 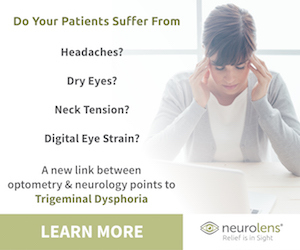 They are thought to be especially relevant for normal-tension glaucoma (NTG) patients. Researchers aimed to investigate which vascular factors, including advanced vascular examinations, better described patients with NTG compared with those with primary open-angle glaucoma (POAG). The Leuven Eye Study database (182 NTG and 202 POAG patients; similar structural and functional damage) was used to compute three multivariate logistic regression models: a conventional model (conventional parameters only, including vascular-related self-reported phenomena, such as migraine or peripheral vasospasm); an advanced vascular model (advanced vascular parameters only: color Doppler imaging (CDI), retinal oximetry, ocular pulse amplitude and choroidal thickness); and a global model, in which both types of parameters were allowed. Receiver operating characteristic (ROC) curves and corresponding areas under the curve (AUC) were calculated and compared between models. Patients with NTG had a higher resistive index and lower early systolic acceleration (ESA) in their retrobulbar vessels and a smaller arteriovenous retinal oxygen saturation difference. The global model showed a significantly better discriminative ability when compared to either the conventional or the advanced vascular models. Also, the conventional and the advanced vascular models showed a similar discriminative ability. Patients with NTG had more signs of vascular dysfunction. Clinical conventional parameters, such as asking simple vascular-related questions, combined with advanced vascular examinations, provided information to better understand the value that non-IOP-related factors play in NTG. SOURCE: Barbosa-Breda J, Van Keer K, Abegão-Pinto L, et al. Improved discrimination between normal-tension and primary open-angle glaucoma with advanced vascular examinations - the Leuven Eye Study. Acta Ophthalmol. 2018; Sep 17. [Epub ahead of print]. Artificial intelligence is a general term that means to accomplish a task mainly by a computer with the least human beings participation, and its beginning is widely accepted to be the invention of robots. With the development of this technology, artificial intelligence has been one of the most influential information technology revolutions. Authors searched English-language studies relative to ophthalmology published on PubMed and Springer databases. The application of artificial intelligence in ophthalmology mainly has concentrated on the diseases with a high incidence, such as diabetic retinopathy, age-related macular degeneration, glaucoma, retinopathy of prematurity, age-related or congenital cataract, and a few instances with retinal vein occlusion. According to studies uncovered, the authors concluded that AI’s sensitivity of detection and accuracy ranged from: for proliferative diabetic retinopathy, 75% to 91.7%, for non-proliferative diabetic retinopathy, 75% to 94.7%; for age-related macular degeneration, 75% to 100%; for retinopathy of prematurity, over 95%; for retinal vein occlusion, one study reported over 97%; for glaucoma, 63.7% to 93.1%; and for cataract, more than 70% similarity against clinical grading. SOURCE: Du XL, Li WB, Hu BJ. Application of artificial intelligence in ophthalmology. Int J Ophthalmol. 2018;11(9):1555-61. A retrospective, consecutive, noncomparative interventional series of cases included 136 cosmetically disabled eyes (due to different corneal abnormalities) of 130 patients to report the use of different superficial keratopigmentation (KTP) techniques for restoring or enhancing cosmetic appearance of impaired eyes. A total of 222 procedures of superficial manual KTP and superficial automated KTP were performed. The procedures were divided into two groups: first and second-stage procedures. The patients' cosmetic appearances and satisfaction were evaluated and graded as excellent, good or poor. A total of 222 procedures were performed: 57.2% superficial automated KTP, 22.5% superficial manual KTP, and 20.3% combination superficial KTP with other KTP techniques. Six procedures were purely cosmetic, 16 were therapeutic functional and 200 were therapeutic cosmetic. Superficial KTP as a second-stage procedure was performed in 13 eyes that were previously pigmented by intrastromal techniques. Superficial KTP as an initial indication (first-stage procedure) alone or in combination with another KTP technique in the same surgery was performed in 123 eyes, of which 44.7% were reoperated once or more. Best-corrected visual acuity changed insignificantly, and intraocular pressure decreased significantly in all of the studied groups. No intraoperative complications were observed; 11.2% of eyes with a follow-up time of more than three months developed postoperative complications. Most patients (98.5%) were satisfied. The modern superficial KTP procedure provided the possibility of improving the cosmetic appearance of impaired eyes, as an alternative to evisceration, enucleation, prosthetic contact lenses or keratoplasty. SOURCE: Al-Shymali O, Rodriguez AE, Amesty MA, et al. Superficial keratopigmentation: an alternative solution for patients with cosmetically or functionally impaired eyes. Cornea. 2018; Sep 14. [Epub ahead of print]. Essilor Instruments introduced the KAPPA Special Edition edger to add to its line of lens finishing systems. The mid-range robust edging system is designed to offer speed, precision and ease of use. The new high curve function expands the field of possibilities, with base curve coverage up to 8, and with adjustable bevel height, width and location. Professionals are encouraged to visit the company’s booth (#LP6065) at 2018 Vision Expo West for an in-depth demonstration of KAPPA Special Edition. Learn more. Sun Pharmaceutical Industries announced FDA approval for the New Drug Application of Xelpros (latanoprost ophthalmic emulsion) 0.005% for the reduction of elevated intraocular pressure in individuals with open-angle glaucoma or ocular hypertension. The approval is from Sun Pharma’s Halol (Gujarat, India) facility. (Sun Pharmaceutical in-licensed Xelpros from SPARC in June 2015.) Xelpros—the first and only form of latanoprost that isn’t formulated with benzalkonium chloride—was developed using SPARC’s proprietary Swollen Micelle Microemulsion technology. In randomized, controlled clinical trials of individuals with OAG or OH with a mean baseline IOP of 23 to 26 mmHg, Xelpros lowered IOP by a mean of up to 6 to 8 mmHg. Read more. STAAR Surgical announced that the FDA granted approval of the PMA Supplement for the Visian Toric ICL for the correction of myopia with astigmatism. This approval represents a meaningful expansion of the Implantable Collamer Lens product line for the correction of refractive error in individuals with both myopia and astigmatism. The ICL in both spherical and toric designs has been associated with significant improvements in quality of life. Read more. MacuLogix launched its AMD Academy—an online learning community for AdaptDx users, delivering video-based product training and a user forum to facilitate discussion of best practices and answers to user questions. A comprehensive learning plan for the AdaptDx automated dark adaptometer features 21 short, video-based learning modules. New users can quickly learn how to prepare and run the test, manage patient data and more. After completing the courses, learners will earn an AdaptDx Online Training Certificate. Visit the company’s booth #MS5048 at Vision Expo West to learn more. Read more. IDOC announced a new benefit designed to increase revenue and accelerate growth for members. IDOC Select Rewards offers IDOC Select members quarterly share-based rebates on premium optical brands in addition to existing biannual vendor rebates now available. Safilo, a provider of premium sunglasses, optical frames and sports eyewear, is the first of IDOC’s frame vendors to offer IDOC Select Rewards. Eligible IDOC Select Rewards participants will receive shared-based rebates on actual dispensed products, eliminating the need to keep frame stock on hand to qualify. Learn more. Heidelberg Engineering received FDA clearance for its OCT Angiography Module. The additional module is now available for new and existing Spectralis upgradeable diagnostic imaging devices. Read more.